As always, I'm very delighted to share the press release for the annual Houston Barbecue Festival. Love the guys who put this on, and they just make it better and better every year. Good luck with this one! 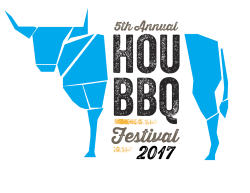 WHAT: The 5th Annual Houston Barbecue Festival will celebrate and recognize what is unique about Houston barbecue. WHEN: Sunday, April 9th, 2017 from 1:00-4:00pm. VIP Admission at 12pm. WHERE: NRG Park, Green Lot. Parking entrance on Lantern Point Drive. COST: General Admission ($60) includes entry into the festival and unlimited sample portions from each participating Houston barbecue joint. VIP Admission ($120) includes entry into the festival one hour early (at noon) and unlimited sample portions from each participating Houston barbecue joint. A T-shirt and one (1) drink ticket are also included in VIP admission. To ensure a quality event for everyone involved, ticket sales are limited. PRE-SALE discount tickets of $50 for General Admission and $100 for VIP are now available for a limited time. All tickets sold in advance, online at https://houbbq2017.eventbrite.com. No ticket sales at the door. Tickets for the four previous festivals sold out before the day of the event. Beer and wine will be served for an additional cost. Live music will be provided. Now in its fifth year, the Houston Barbecue Festival will continue to showcase the best that Houston barbecue has to offer to a growing and diverse audience of barbecue lovers. This year's festival feature's who's who of Houston's best barbecue. Currently confirmed are: Blake’s BBQ, Blood Bros. BBQ, The Brisket House, Brooks’ Place BBQ, CorkScrew BBQ, El Burro & the Bull, Fainmous BBQ, Feges BBQ, Gatlin’s BBQ, Gerardo’s, Harlem Road Texas BBQ, Killen's Barbecue, Lenox Bar-B-Que, Louie Mueller Barbecue, Pappa Charlies Barbeque, Pinkerton's BBQ, Pizzitola’s Bar-B-Cue, Ray’s BBQ Shack, Roegels Barbecue Co., Southside Market & BBQ, Spring Creek Barbeque, Tejas Chocolate (and BBQ), and Tin Roof BBQ. Additional participants, reflecting the fast-growing Houston barbecue market, will be announced in the coming weeks. The fifth year of the festival will also reflect the international phenomenon that is Texas barbecue. "We've seen international interest in the festival increase over the last five years," says J.C. Reid, co-founder and director. "Last year, we had guests from as far away as England, France and Germany. This year, we've already had inquiries from New Zealand and Australia." "The value proposition for our festival is simple - Houston's best barbecue all in one place, at one time, for one price. For out-of-town guests, visiting all these great Houston and Texas barbecue restaurants individually would takes weeks to accomplish." "Though our primary focus will always be on traditional Houston and Texas barbecue, we hope to continue to add examples of international flavors that Houston is known for," says Reid. Also new this year is the availability of gift cards for purchase. There's no better gift than Houston barbecue, and now barbecue fans can buy these gift cards that recipients can redeem for tickets to the festival. "Houston barbecue fans are passionate, and they love nothing more than to share that passion with their friends and family," says Reid. "The gift cards allow them to spread the word of Houston barbecue far and wide." This year's premier partners represent two of Houston's most recognizable brands. Saint Arnold Brewing Company is Texas' oldest craft brewery and a long-time supporter of Houston barbecue. Pitt's & Spitt's has been building consumer and custom barbecue pits for Houstonians and international customers alike since 1983. Founded in 1982, Vita-Living, Inc. is a 501(c)(3) social services charity that provides lifelong support programs for adults and children with disabilities like cerebral palsy and autism. We operate on the precept that every human being deserves an equal right to a decent life. A portion of all ticket sales and sponsorships will be contributed to the important mission of Vita-Living, Inc. This was an excellent event last year and now there are even more purveyors of BBQ! how can it get better than that? I bought the VIP pass and was more 'que than even I could eat, which was saying something. That and Saint Arnold's fantastic brew. Excellent event.